Olympus Optical Corporation has produced several camera series which have what can only be described as fanatical followings. Most were designed by a Yoshihisa Maitani. The Olympus Pen series of half-frame SLRs is one of his classic designs. Also check my page on the Olympus XA. Using the text, charts, or images on this website without permission on an ebay auction or any other site is a violation of federal law. Various companies had been trying to make SLRs as compact as the rangefinders that they were replacing. But most of their efforts were ineffective. The problem was the big, heavy pentaprism that defined the contemporary SLR. With it, you could focus and meter through the taking lens, but it was large and bulky. The Olympus Pen turned that thinking on its head. It used a complex series of internal prisms rather than a pentaprism. It used a rotating focal plane shutter instead of the complex cloth or metal curtain shutters. And it was half-frame, which gave the user twice as many photos (48~72 shots/roll) and allowed for the lenses to be smaller and more compact. Except that photos were just a bit more grainy, the entire system only had positives. Using the text, charts, or images on this website without permission on an ebay auction or any other site is a violation of federal law. The Pen F is a complex camera because of its miniaturization. My unit was apparently used in a university setting, where it saw plenty of action. The film wind lever was no longer single-wind, but took one and a quarter wind strokes. I sent it off to Oleg Khalyavin to fix. 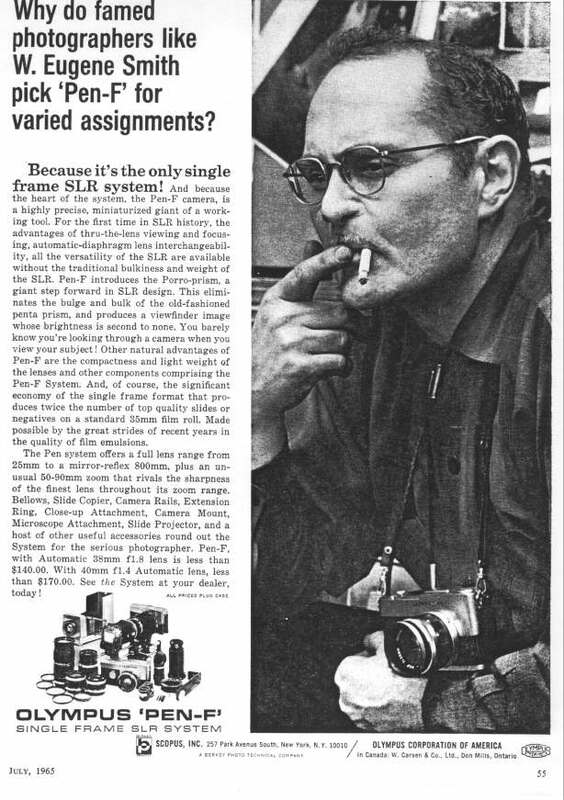 The Pen F is famous for its advertisement featuring famed photographer W. Eugene Smith. In fact, one of the ads showed the entire system fitting into his shoes! In March of 2009, I decided to sell my Pen-FT on ebay as I wasn't using it anymore. Using the text, charts, or images on this website without permission on an ebay auction or any other site is a violation of federal law.